Toronto, Ontario – January 30, 2018 – U3O8 Corp. (TSX: UWE), (OTCQB: UWEFF) (“U3O8 Corp.” or the “Company”) reports that a trial has commenced to test the effectiveness of geophysics to detect channels at the base of the gravel layer at its Laguna Salada Deposit (“Deposit” or “Property”) in Argentina. 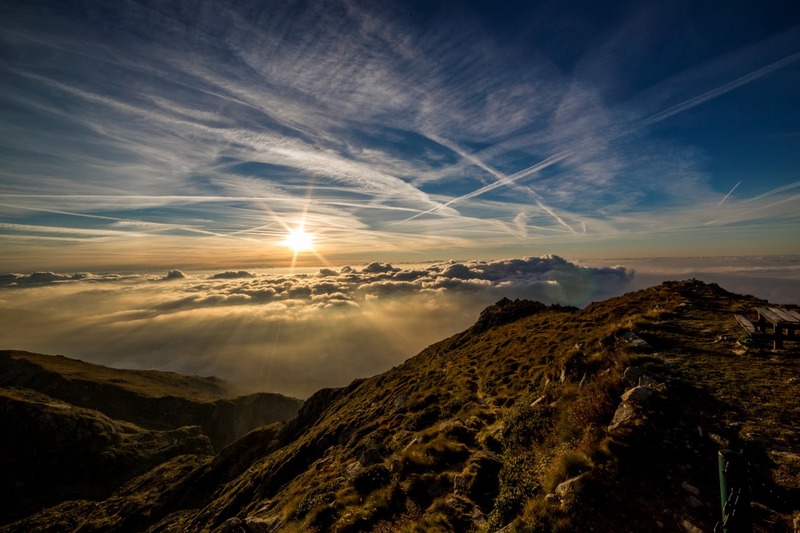 Exploration elsewhere on the Property has shown that channels contain higher-grade uranium-vanadium mineralization that could further improve the positive economics of the Deposit. The NI43-101 resource at Laguna Salada was based principally on a one-metre thick layer of uranium-vanadium bearing gravel that extends from surface to a maximum depth of only three metres. Exploration that was completed following the resource estimate, revealed a second layer in which uranium and vanadium are confined to channels at the base of the gravel. 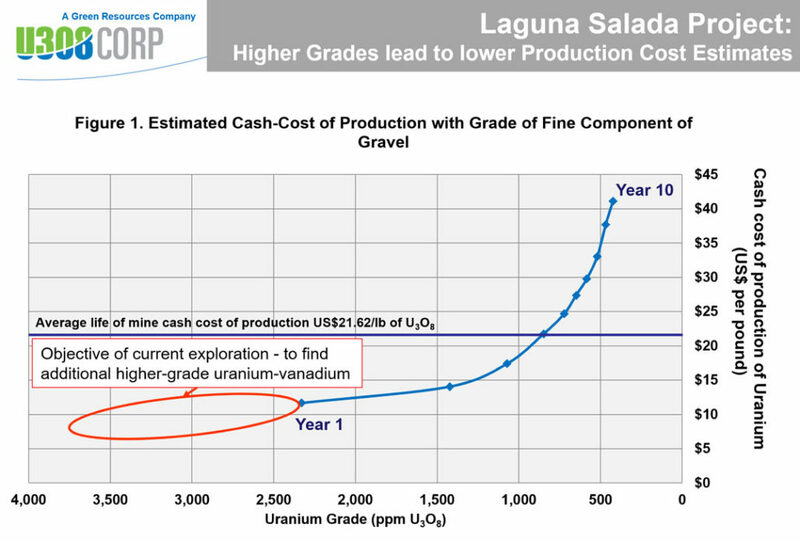 The second layer contains generally higher uranium-vanadium grades that may result in the estimated cash-cost of production being even lower than for the near-surface material on which the preliminary economic assessment (“PEA”) was based (Figure 1). Trials are underway to determine the effectiveness of Electrical Resistivity to detect these buried channels. The test work is being done in an area within the Laguna Salada Deposit where drilling detected channels that contain higher-grade mineralization. The test work is expected to be completed in mid-February, and if successful, a more extensive geophysical program will be considered to provide specific targets for exploration by pitting with an excavator. Having studied the test work on which the PEA was based, and after spending three weeks in Argentina, Mr. John Rae has selected and ordered the equipment required to separate the fine-grained uranium-vanadium from the pebbles in Laguna Salada gravel. John Rae is a mining engineer who has 40 years of experience in the extraction of various commodities from gravel. The proof of concept test work will continue through the first quarter of 2018 and results will be reported as they become available. A Russian State-owned uranium production company has announced that it plans to spend up to US$250 million in exploration for, and development of, uranium deposits that are amenable to in situ leach extraction in Chubut Province in southern Argentina. U3O8 Corp. holds approximately 40,000 square kilometres (approximately 15,000 square miles) of exploration concessions in the area that is being targeted for this type of sandstone-hosted mineralization that typically lies at approximately 100-150 metres depth in the target area. Despite the potential of the sandstone-hosted mineralization, U3O8 Corp. prioritized exploration at Laguna Salada where resource definition in the shallow-lying mineralization can be done more cost-effectively. In addition, Laguna Salada – style mineralization contains vanadium – a fundamentally important by-product both in terms of strengthening the economics of the Deposit, and in providing a key commodity for construction steel and for industrial-scale vanadium redox batteries. The vanadium price has risen strongly over the last past year in response to a shortage of supply in the international vanadium market (Figure 2).